Gail made an Aunt Maggie's Dancin Shoes and sent me a picture of it, which is shown a few pages earlier than this one. She made it for her husband for Father's Day. 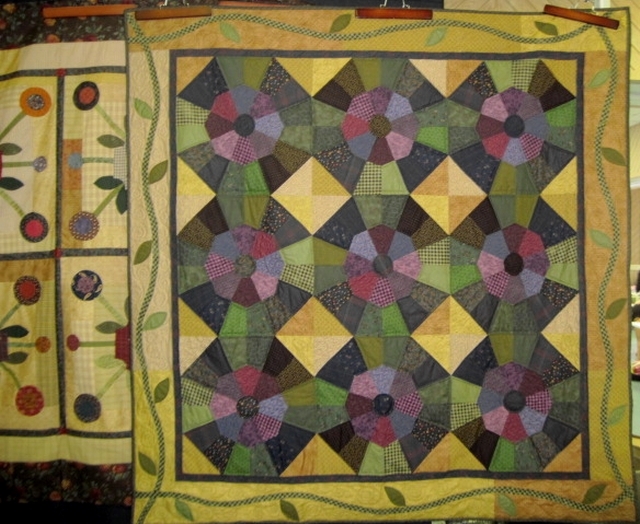 Jeanne Arnieri sent me this picture of her Let's Play Jacks quilt from the Primitive Youngins book...she calls it Appleseed because of the black triangles in the center. How fun is that? Great job Jeanne! 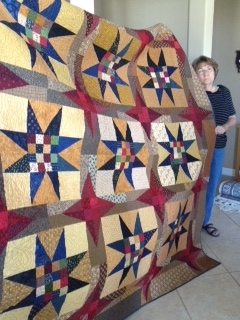 Charlene Higgins sent me this picture of her "Burning the Midnight Oil" quilt It's absolutely stunning! Great job! Melanie (R) shared her May Baskets with me when I was in Quilt's on Plum Lane one Saturday. I took a picture of her and Donna Lillibridge, the owner of the shop.. It's wonderful Melanie..Thanks so much for sharing! Rita from the Twinkle Quilt Shop in Spain sent me this picture of her "A Tisket A Tasket Quilt" I love that she changed the colors and thought outside that box! It's great Rita....thank you! 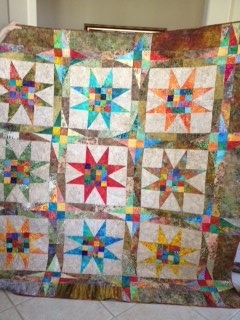 Colleen sent me this picture of her "Sampler" quilt - which is wonderful! She used parts from several of my patterns and made it her own way! What a lovely quilt. Thanks Colleen! Carol Edwards sent me this picture of her "Purl"....Thanks so much Carol. I just laugh every time I get a picture of one of these to share. I hope she's a big help to you in your sewing room! 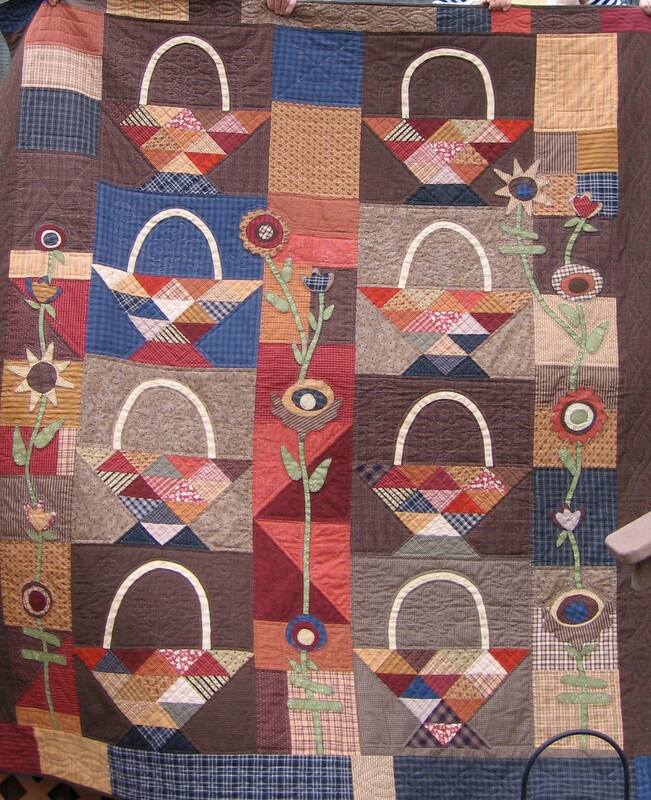 Sharon Weir sent me this picture of her Horse Feather quilt. It's just lovely lovely Sharon, Thanks so much for sharing!!! Clair Birch from Victoria, BC sent me this picture of her "I Caught Santa" wool table rug she made from the Christmas Bundle pattern. How sweet is that? Thanks so much Claire for sharing with us. My Purl has another NEW cousin! LuAnn Leonard sent me this picture of her "Purl" I just know she will be as handy as mine is in her sewing room! Thanks for sharing LuAnn......she's very fun! 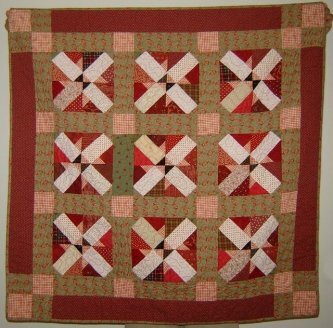 Angelas A Tisket a Tasket Quilt. They all turned out so very nice Angela! Perhaps if you live in the Ash, North Carolina area you might like to stop by for a visit and see them all in person. Becky sent me a picture of another one os Purl's cousins - "TILLIE" Isn't she adorable? And, looks so at home next to that adorable featherweight. Purl likes my feather weight too Becky! Thanks so much for sharing! Charlene has been busy! Here's a picture of her Slim Pickins. Great job Charlene! Love your color choices! Margaret Witt from Illinois sent me this delightful picture of her WABBITT's Pillow. I love seeing something different made from one of my patterns....great job Maggey! Angela Brady, owner of HOMESPUN GATHERINGS Quilt Shop sent me these pictures to share of her "A LITTLE PORCH TIME" quilt and her "MAY BASKETS" table runner. You did a wonderful job Angie. Thanks for sharing! 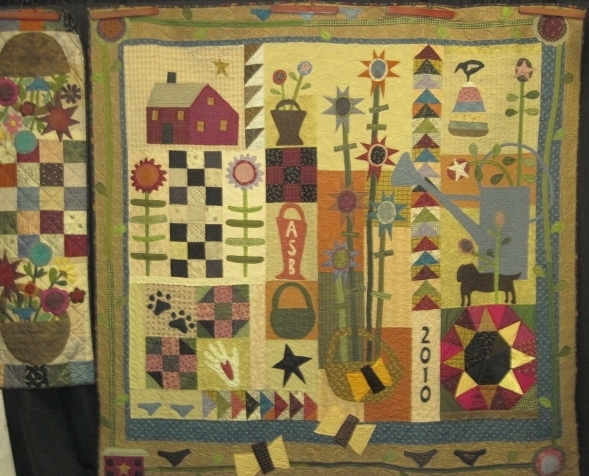 More of Angela Brady's quilts - "Aunt Ree's Raspberry Jam" and on the left "The Bundling Board" - if you are in the Ash, North Carolina area stop by Homespun Gatherings - I bet you can see all of these quilts hanging in her shop. Janice Chang made her Stars on a Tin Roof out of her favorite colors of batiks. It turned out love Janice...thanks so much for sharing a picture. 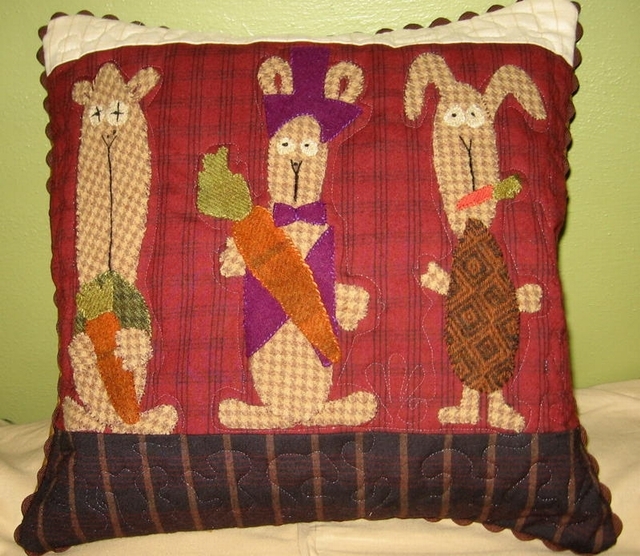 Sharon Paladino from Omaha, Nebraska made her WABBITS into a 20 inch pillow that is gracing her couch for the Easter season. You did a great job! I really do love when I get pictures of quilts made from one of my patterns. Rori sent me this picture of the quilt, They'll be Coming Around the Mountain, she made for her son's collage graduation just recently. Rori you did a wonderful job. Thanks so much for sharing it wth all of us. Congratulations to your collage graduate too! 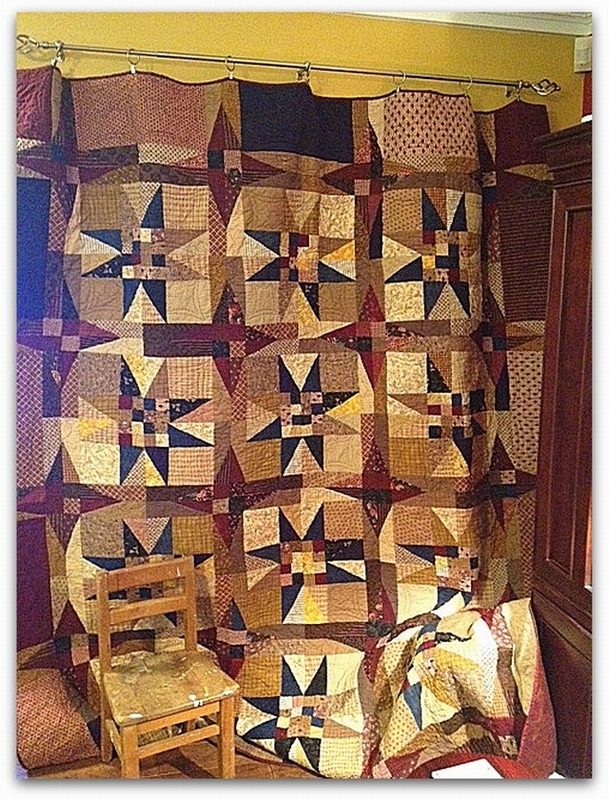 Katherine Christenson, my local machine quilter extraodinaire, finished her Stars on a Tin Roof quilt. 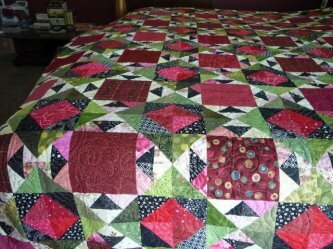 This quilt has 9 large blocks, but Catherine made hers 15....great job Catherine! Thanks for sharing your finished quilt with us. 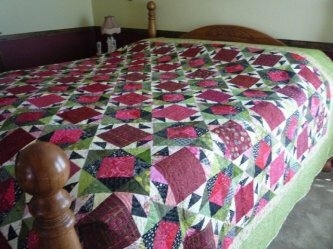 Just had to share this picture sent to me by Margaret Witt....her A Tisket A Tasket Quilt turned out lovely and she says, her hubby did all the hand quilting. Great Job! 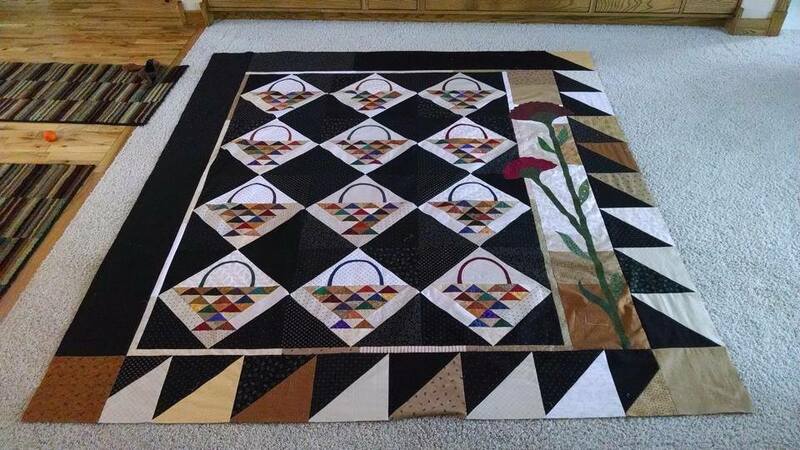 Dorothy Looman sent me this picture of her Gathering Baskets quilt! Wonderful job and thank u so much for sharing!